First exhibition of paintings in the world’s most visited museum the Louvre was opened on 1793. But its building was well-known far beyond France, though the edifice was not used with such lofty cultural purposes. Built in the 12th century, the Louvre used to serve as a fortress, a residential palace and housed art exhibitions of the Académie des Inscriptions et Belles-Lettres. Fortunately, now there is no need to use famous French landmark as defensive construction. Long ago it became a must-visit point on the map of any fine art lover. Though today we are not going to explore the collection hosted by the Palace, but refer to facts owing to which the museum enjoys its wide popularity. Just imagine: last year a new attendance record was set – almost 9 million people! 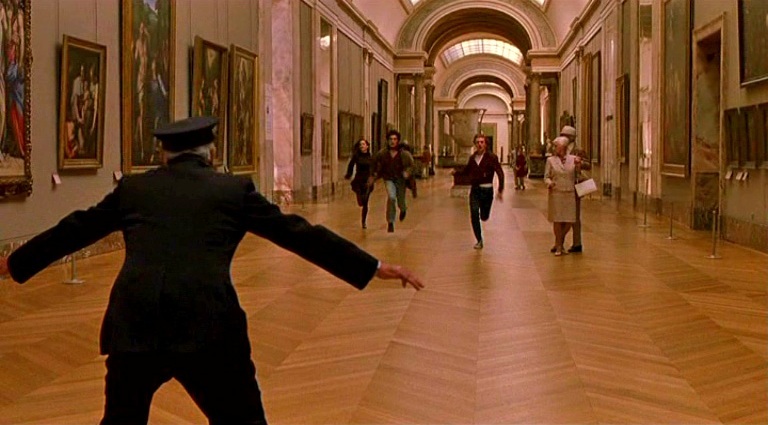 The Grande Galerie of the Louvre is the hugest interior corridor in the world. Previously on rainy days the French monarchs stuffed tunnel with rocks and trees, let animals in and... hunt began. Being the exhibition gallery, the corridor is sometimes used by moviemakers. For instance, the lead characters of Bertolucci’s The Dreamers are running through it. In the 18th century the Louvre got into hard times when nobles moved to Versailles, and the fortress dominating the heart of Paris sank into oblivion. The abandoned edifice remained empty and was falling into ruins as much as 50 years. Everything changed after Napoleon Bonaparte came to power. The Emperor arranged completion and restoration of the building and its objects. As a result, the Louvre changed its name: in the Emperor’s time the fortress was called the Musée Napoléon. Most rulers seek to modify important historical sites. And, as a rule, their attempts fail. But not in the Louvre case. Many French leaders tried to bring something new to the look of the famous fortress. Construction of the glass pyramid at the entrance was the latest architectural contribution. It appeared quite recently, less than 30 years ago when François Mitterrand was in power. At first glance a copy of the Egyptian star attraction seems to be fairly easy. In fact glass building weighs about 180 tons and has a considerable height of 22 meters. And some more words about the pyramid. It is surrounded by numerous legends and riddles, although it is only a bit more than 20 years old. 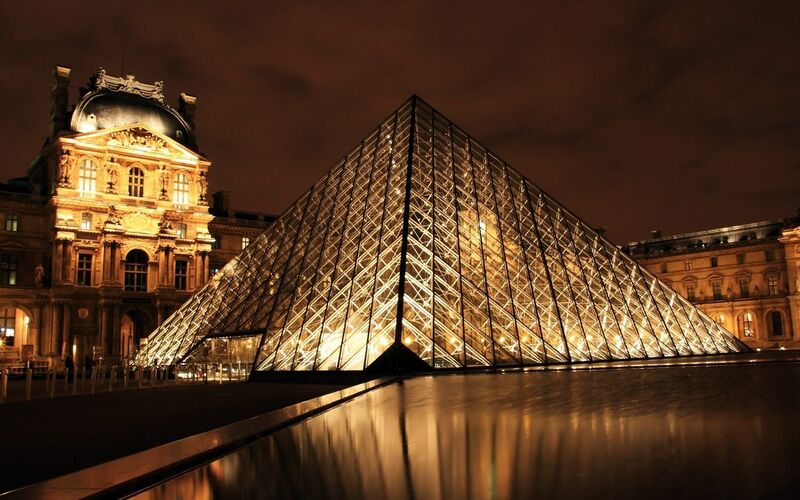 Most often it is associated with name of Satan: as the rumour says, the glass panes in the Louvre pyramid number exactly 666, so it was built by the beast. But those particularly superstitious or impressionable shall not worry. One can safely go on a trip since the official number of the panes, fortunately, is 673. The hall of the Russian culture and art will be opened after 2015. Now it is still a question which exhibits will be chosen for it. Most likely, spiritual patrimony of northern neighbours will be mainly presented by iconography since this very kind of national painting remains the most interesting for foreigners. 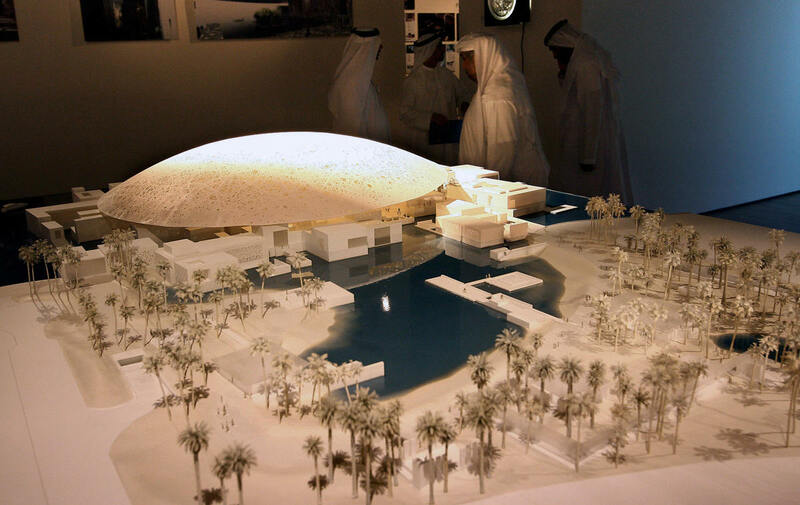 The United Arab Emirates decided not to wait for having the hall devoted to their culture. 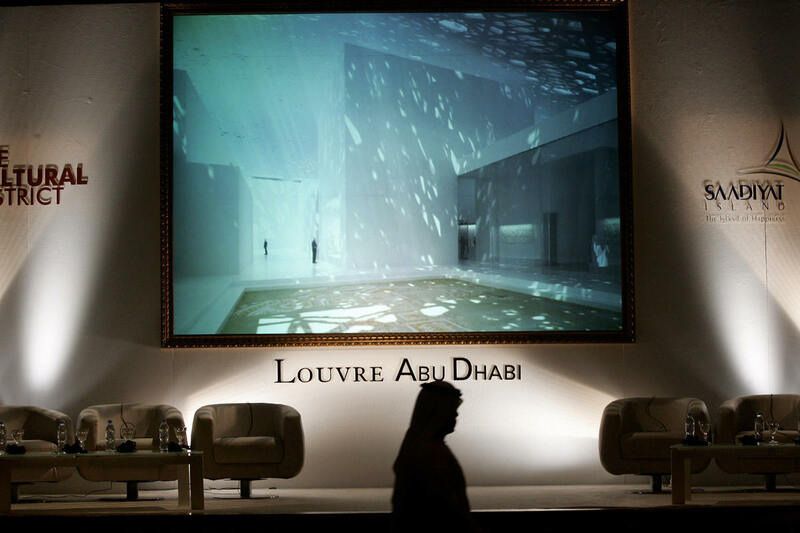 The sheikhs have started building a branch of the Louvre in Abu Dhabi. The most exciting thing is that in 2007 they paid 400 million EUR for franchise. So, now without any remorse, the Arabs can have their own Louvre. Time will show if it will be the same sumptuous as everything in the UAE. At the end of 2011 the French art experts raised a scandal: they accused the British company which restored Leonardo da Vinci's The Virgin and Child with St. Anne. Art critics claimed that after the restoration the canvas looked too bright. The British reasonably responded that they did everything exactly according to the information that survived since Leonardo’s time. During the Second World War, the most famous masterpieces of the Louvre were removed from the Louvre and taken safely to French village. Surely, the Mona Lisa survived the longest journey. During the war this painting has changed as much as 5 addresses. Just see what conspiracy can do! In addition to the secrets and mysteries of the Mona Lisa, tourists are fond of many Louvre legends. The most popular one is about the ghost of an ancient Egyptian whose mummy was brought to the museum in the early 20th century. The ghost was nicknamed Belphégor (the name of archdemon). The spirit walks at night through the Louvre and hails terrible curses on anyone he meets. If you do decide to visit the Louvre, and no mysteries and legends frighten you, well, that's great. And while someone may think of the museum as the cheesiest place of Paris, you can be sure of one thing: everyone can find something interesting there. Well, as a last resort, you can always take a picture of the Mona Lisa with your mobile phone and then say confidently And I saw it too! Approximately 53% of the world's population lives in cities, which in contrast to villages where highways are almost the same, consist of many routs: long and short, wide and narrow, beautiful and plain. There are no criteria: someone admires Rio slums more than Broadway Avenue. We will not judge what is best or worst, but just focus on data. For many tourists France is mainly Paris with long queues to the Eiffel Tower and the Louvre, as well as neighbouring sights with royal chic, or Mediterranean resorts. But OUTLOOK author while travelling through the country decided to go to the north, to Normandy! Our readers are welcome to read series of travel essays about a journey to the Atlantic Ocean by Kornei Gritsyuk, and the story begins with his impressions from the town of Deauville! Where to look for Clementin, the narrowest hotel in Czech Republic merely 3.28 meters wide, how to chose between Pilsner Urquel, Krušovice and Gambrinus, when to feed gold-colored carps and why tram 91 has no peer? Elvira Matrosova learned about these and more. And despite the fact that this city stands on Vltava (Wilth-ahwa – literally means Wild water), it is aristocratic, consistent and calm yet far from Puritanism. Aroma of hop, buns and coffee all around is an unmistakable sign of Prague being glad to indulge all touristic weaknesses of yours – so get ready! Thanks to the Embassy of Uzbekistan in Ukraine and personally Ambassador extraordinary and Plenipotentiary Alisher Abdualiev OUTLOOK was lucky enough to visit this hospitable country. And today we will tell about a unique place - the Mausoleum of the prominent military leader and political figure of Amir Temur. American Detroit was until recently known as the automotive capital. But nowadays it is more often than not mentioned in the context of decline and population outflow. Outlook decided to figure out why ghost cities emerge. They become the place for the coolest parties, source of extraordinary ideas and unpredictable discoveries. Nowadays whole houses, temples, gardens, pools and stadiums reach peaks of their popularity – all of them on tops of buildings.